Do you know the inners of the GS/OS AppleDisk5.25 driver? Do you even know its limits? Don't you want to bypass them? That is the aim of that project. Any other ideas? Feel free to use the Contact page to send me an email. The DOS 3.3 FST now supports the Format/Erase commands and that works well. We can now format DOS 3.3 disks directly from the Finder. The DOS 3.2 FST works pretty well, all previous bugs have been removed. 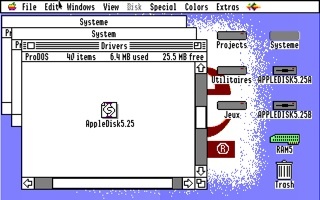 The AppleDisk 5.25 driver now contains DOS 3.2 (or 13-sectors) Read/Write/Format routines. I have removed some limitations so that RDOS 3.2 disks can be read, that is one the next step: create the RDOS 3.2 FST. I am unable to format a DOS 3.2 (or 13-sectors) disk with my code (I only format the first track ;-). And I cannot use my preferred emulator to format disks as well, Sweet16 does not allow me to format DOS 3.2/DOS 3.3 disks, it appears there are some limitations on the 5.25 driver code. No news is good news! I am late because I was busy working on the disassembly of the IIgs ROM. A job focused on the toolsets included in the ROM of a ROM 01 machine. That is another project I am working on and I will introduce you to it once I am done with the AppleDisk5.25 driver update. The driver now reads and formats 13-sec disks! The driver is still unable to write 13-sec sectors, quite weird: the nibblize routine is correct but the data written is bad: timing issue maybe! The RDOS 3.2 FST is written but I think I will not make it public because RDOS 3.2 disks contain a lot of different header nibbles and I do not want to pollute my routines. I must finalize the 13-sec write routine before I go back to work on the CP/M FST.